Whatever, I feel a new dream is coming and I feel like the dream is dreaming me! Two of the new or enhanced abilities of the post menopausal woman are increased intuition and visionary capacity – and with my time travel, I have seen the harvest ahead and so then I have access to a deeper knowing of what the seed and seedling needs to get there. For example, I see the seedling of our own ‘private hospital’ and I know this is not the only one…. Earlier this year at the Seven Sisters Festival in Melbourne, Australia, I presented a session with Rhea Dempsey. We called it Birth in the Dystopia. Rhea and I will be presenting again on this subject at the Homebirth Conference in Sydney in November. Part of the session at Seven Sisters was a journey for the participants to meet with their Great-Great-Grandchildren to ask them what they needed to do now to prepare for them, especially regarding their opportunities for birthing. And since then, of course, I too have been receiving messages from the Great-Great-Grandchildren. These messages come to me in the form of dreams for the future, my dreams for the Great-Great-Grandchildren. Sanctuaries that offer a safe birthplace, an education facility, food grown in the old ways with saved seeds, self sustained villages…. And to bring this into this reality, I am feeling we need: The Grandmother’s Pact! A global circle of Grandmothers working with the energies of creation to bring forth Global Sanctuaries, villages where the Great-Great-Grandchildren will thrive. A part of me feels this to be such an audacious dream, and questions arise such as – how?! But because I know the importance of the why, and because I feel my Grandmother heart race with Joy at the idea of preparing for the future for all our relations, especially the Great-Great-Grandchildren, and even further to the seven generations ahead… I will let go of my own feelings of fear and doubt and I will play my part in this…. Now I’m not attached to this particular plan, but this time I am attached to the outcome. The outcome is to set up for the Great-Great-Grandchildren self-sustainable villages, including a birth centre and education facility which teaches the practical arts of living including healing, health care, and everything you need to know to look after yourself and your children. 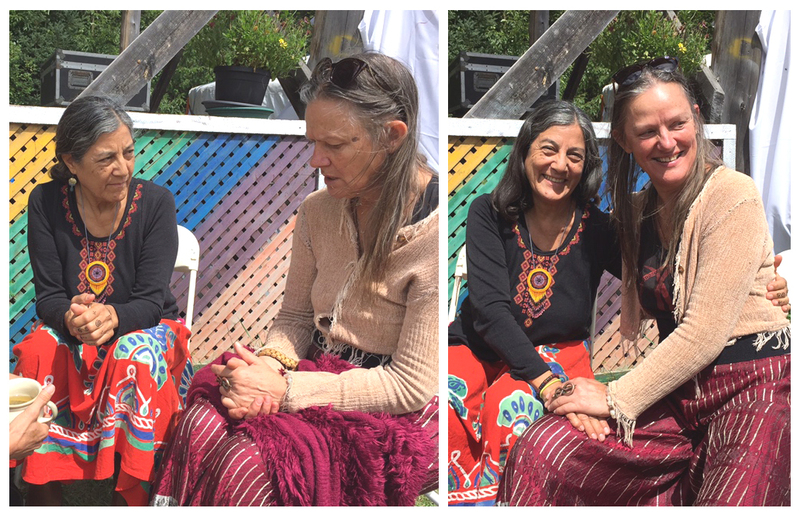 I also connected again, after four years since the Squatfest in San Francisco, with the awesome Molly Dutton-Kenny who has inspired me to begin to imagine offering a Full Spectrum Doula Training Program. And Samantha Zipporah, who introduced me, Sequoia and Grace to the Ovary Gang (see below!). I’m going to dream big, for all our relations, because I care. Just wonderful! You have dreamt it up and so it will be. I spoke to women recently in the Spiritual Path Of Menopause to look for causes/visions to support. Keep us posted on what is needed to bring this Dream into Birth. It is time to collaborate and pollinate. Great Blessings on this big Call.